Elastic search is the name of a search engine used for searching all kinds of documents. Elastic search is centred on Lucene. It provides a circulated, multitenant proficient full text search server along with a Restful web interface and schema free JSON documents. Elastic search is developed in Java and is released as an open source under the terms of the Apache licence. Elastic search is the second most famous search engine. Elastic search provides scalable search and consists of real time search and supports multitenancy. Elastic search is distributed which implies that indices can be divided into shards and each shard can have zero or more duplications. Each node hosts one or more shards, and acts as a controller to delegate operations to the correct shards. It automatically performs the rebalancing and rerouting. Elastic search makes use of Lucene and tries to provide all of its features through the Java API and JSON. Elastic search supports faceting and percolating which can be useful for notifying if new documents match for registered queries. One of its features is known as gateway which handles the long term persistence of the index. It helps in recovering the index in case of any emergency such as a server crash. Elastic search supports real time GET requests which makes it suitable as a NoSQL solution but it lacks distributed transactions. 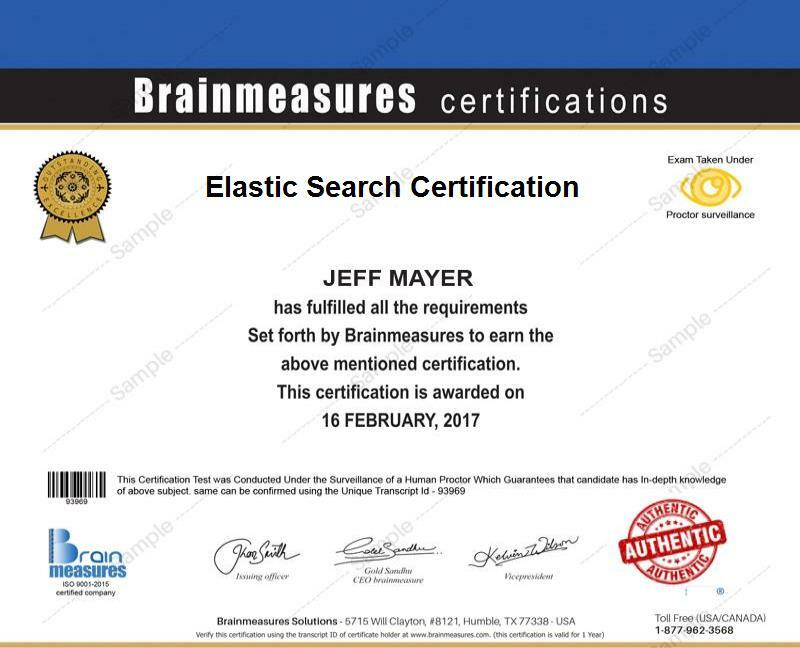 The Elastic search certification course by Brainmeasures provides an in-depth guidance and explanation of the subject. Courses by Brainmeasures have clarity and are straightforward which enables the participant to understand and analyse all its aspects clearly. Elastic search is an extremely helpful search engine in context to documents and important files that one requires and can make use of such an efficient search engine for the same. Elastic Search is the most widely used search engine nowadays. It comprises of such smart features that enable you to perform all your tasks efficiently and rapidly. Brainmeasures is an ISO certified online professional certification company renowned for their world class teaching standards and skill testing. After getting enrolled in this course you would receive an E-book that would guide you for the online exam. Upon successful completion of the online exam, you would be awarded the certificate by Brainmeasures. Brainmeasures is an established online certification company famous for their excellent guidance and teaching procedures. Certifications by Brainmeasures are accepted and recognized all over the world. The average salary of a Data Engineer is around $106,545 whereas that of a Software Developer is around $92,660. Salaries vary depending upon the personal experience and qualifications of an individual. Introduces you to Elastic search and begins with understanding nodes and clusters. Explains about downloading and setting up Elastic search. How to manage mapping introduction by using explicit mapping creation. Discusses the basic operations and creating an index. Discusses about search, queries, and filters introduction. Introduces you to aggregations and how to execute an aggregation. Introduces you to scripting and installing additional script plugins. Discusses about Rivers introduction and managing a river. Introduces you to cluster and node modification. Introduces you to Java Integration. Introduces you to Python Integration. Introduces you to Plugin Development and creating a site plugin. The Elastic search certification course by Brainmeasures is an advanced course that explains all the elements and features of the Elastic search engine and is highly beneficial for all those individuals involved in software developing, data operations, data handling and processing. Since it is the second most widely used search engine, pursuing a course in Elastic search from Brainmeasures is a great opportunity and would be extremely beneficial for you. This comprehensive course by Brainmeasures is a well-designed course that imparts all the required knowledge and skills to learn its complete set of features. Braimeasures take special care in designing their courses and this is the reason certifications by Brainmeasures hold a higher value and your chances of getting recruited in a reputed organization increase rapidly.